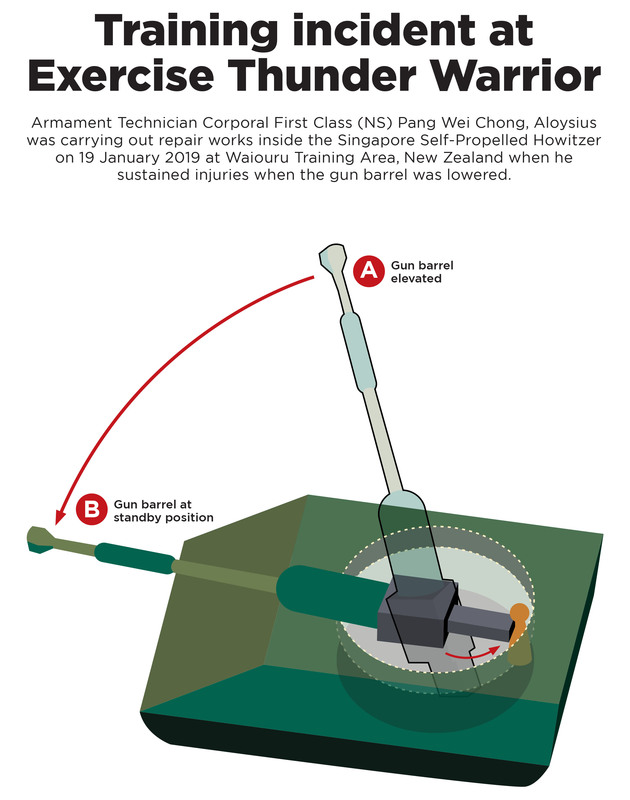 A video was shown in Parliament on Monday (Feb 11) on the safety drill for the gun-lowering mechanism of the Singapore Self-Propelled Howitzer. It takes about 9 seconds for the gun to be lowered to the horizontal position for maintenance. Inspections did not detect any malfunction of the gun-lowering mechanism of the Singapore Self-Propelled Howitzer (SSPH) that crushed Singapore actor Aloysius Pang and led to his death, Defence Minister Ng Eng Hen told Parliament on Monday (Feb 11). He also gave details of the two other servicemen in the howitzer's cabin during a military exercise in New Zealand with Corporal First Class (NS) Pang, 28, an NS armament technician who died four days after suffering injuries on Jan 19 this year. The two other servicemen were an operationally-ready national serviceman (NSman), with the rank of Third Sergeant, who performed the role of gun detachment commander, and a regular officer holding the rank of Military Expert 2. He is an armament technician. Both, who are experienced with SSPH maintenance, have been redeployed from their operational roles, said Dr Ng. Dr Ng said this crew have been trained specifically on the SSPH and had conducted similar maintenance works on it in the past, adding that during the exercise in New Zealand last month (Jan), checks were done on the guns daily. The defence minister was giving a ministerial statement in response to more than 10 questions filed by MPs relating to training deaths in the Singapore Armed Forces (SAF) in the last two years, as well as the measures taken after the most recent incident involving CFC Pang. On Jan 19, CFC Pang was taking part in an annual live-firing exercise called Thunder Warrior on his seventh in-camp training (ICT). The exercise was held at the Waiouru Training Area. He was doing repair work on the gun's calibration system for accurate firing inside the SSPH when he could not get out of the way of the gun barrel in time as it was being lowered. He was crushed and died of his injuries four days later. Following the incident, Dr Ng said the SAF's "immediate task" was to ensure that there was no "systemic machine malfunction of the SSPH", as this would put other maintenance crew at risk. "Inspections of the SSPH have not detected any machine malfunction of the gun-lowering mechanism," he said. Dr Ng said the regular armament technician in the cabin with Mr Pang has been in service for more than 16 years, with eight years of working experience on the SSPH. It was also his sixth time participating as a technician in Exercise Thunder Warrior. The gun commander was in his eighth ICT and had undergone refresher training prior to his deployment in the exercise, said Dr Ng. Both personnel were not named. Dr Ng said the SSPH's cabin is 2.3m in height, measuring 2.44m from front to rear, and 2.64m from side to side. The gun barrel divides the cabin into two. There is space for the three persons within the cabin to occupy positions on either side of the gun. The gun barrel is usually tilted upwards for firing but needs to be lowered for some types of maintenance work. When fully lowered, the rear end of the gun goes up and ends about 10 cm below the top rim of the cabin, but there is still adequate space for people within the cabin to be in their various safe positions. He said: "During the lowering of the barrel, no one is supposed to be behind the barrel. "Unfortunately, CFC (NS) Pang was caught between the gun barrel and the interior of the SSPH as the gun barrel was lowered, and (he had) sustained compression injuries to his chest and abdominal areas," he said. CFC Pang had undergone refresher training on maintenance tasks in New Zealand before participating in Thunder Warrior. He was also involved in the preparation of more than 10 SSPHs in the exercise, including servicing and maintaining the guns, added Dr Ng. CFC Pang had also attended a two-day refresher Maintenance Vocation Training on the basic functional checks and troubleshooting for the SSPH in his previous ICT in February last year (2018). In this incident, Dr Ng said CFC(NS) Pang, who was first activated, requested and received help from regular technicians as he was unable to resolve the fault. He added that the actor, along with the two others, were familiar with the safety procedures that are taught to all maintenance and SSPH operating crew. The regular technician, who is overall in charge, is responsible in ensuring that the gun has been lowered and fixed in place before any maintenance work can begin, said Dr Ng. He added that the safety instructions also specify safe positions within the SSPH cabin for soldiers to occupy during the gun lowering, as well as safety precautions to be taken. The gun commander, who lowers the gun in operations or during maintenance, must first check to ensure that it is free from obstacles and that no persons are in the travel path of the barrel. Other persons in the cabin are to occupy their safe positions. Dr Ng also responded to a question by Non-Constituency MP Daniel Goh, who asked whether the design of the Singapore Self-Propelled Howitzer will be reviewed to determine possible flaws. "The SSPH prototype platform had undergone extensive trials and evaluations from 2000 to 2002 before its introduction in 2003," Dr Ng said. He added that there has not been any reported injury of servicemen due to the gun being lowered for maintenance, or when operating in or firing the SSPH. He said the SSPH was designed and developed to international military standards, and other militaries also operate tracked 155mm guns with similar gun-lowering mechanisms, such as the United States, South Korea and Germany. The independent Committee of Inquiry (COI), convened on Jan 25, has full access to material and witnesses to determine the facts of the case, he said. "Everything asked for by the COI will be released to them - I do not foresee any information that needs to be withheld for security reasons," added Dr Ng. "We owe it to CFC(NS) Pang and his family, indeed to all Singaporeans, to get to the bottom of what happened, and make things right, to ensure the safety of the NS training system as a whole. "I ask that all of us respect these objective and impartial processes that are underway, to reserve our judgement and wait for the conclusions of the COI, which will be presented in Parliament subsequently."